ASUS has quietly added its first AMD FreeSync 2-supporting monitor to its lineup. 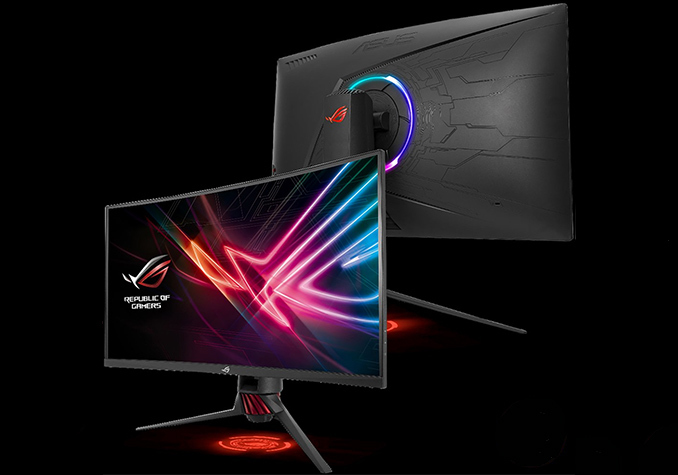 The ROG Strix XG32VQR is a large curved display boasting with a 144 Hz maximum refresh rate, the DisplayHDR 400 badge, and is capable of covering 94% of the the DCI-P3 color gamut. The LCD will be the sixth FreeSync 2 monitor on the market, so it will have only a limited number of competitors. Meanwhile, one of its ways to attract attention of gamers will be its Aura Sync RGB lighting. 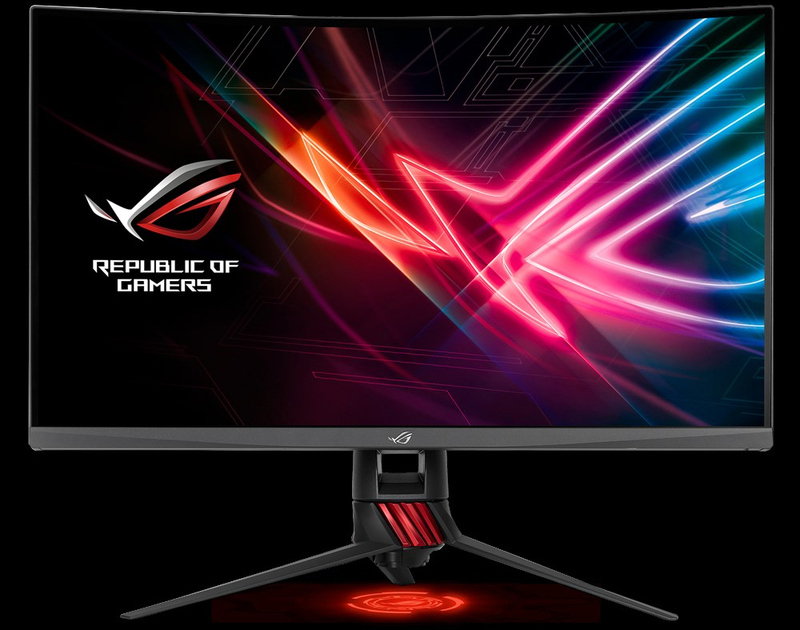 Specifications of the ASUS ROG Strix XG32VQR are generally similar to specs of other FreeSync 2 displays introduced by competing manufacturers this year, but there are a number of important improvements that the ASUS product offers. The monitor uses a 31.5-inch curved VA panel featuring a 2560×1440 resolution, 450 nits brightness (by contrast, competing displays only offer 400 nits brightness), a 3000:1 contrast ratio, 178°/178° viewing angles, a 4 ms response time, and a 144 Hz maximum refresh rate. The LCD can reproduce 94% of the DCI-P3 color gamut as well as 125% of the sRGB color space (keep in mind that everything higher than 100% in case of color spaces is a rather uncertain advantage). Meanwhile, the main features of the ROG Strix XG32VQR are AMD’s FreeSync 2 dynamic refresh rate technology with Low Framerate Compensation tech as well as the DisplayHDR 400 badge. The FreeSync 2 range that ASUS offers is between 48 Hz and 144 Hz, which is broader than that offered by competing displays supporting the tech (from 72 Hz to 144 Hz). 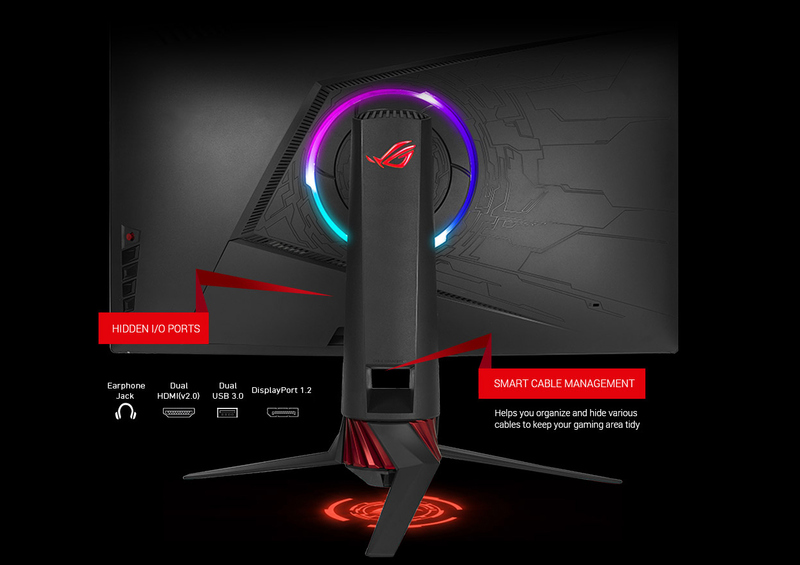 Speaking of competitors, it is necessary to note that apart from higher luminance and broader FS2 range, the ROG Strix XG32VQR features ASUS Aura RGB lighting on the back as well as an LED-based ROG signature on the bottom. RGB and lighting effects are quite trendy among gaming community these days, so these features will clearly attract attention of the target audience. Other capabilities that will be appreciated by gamers include firmware-based GamePlus and GameVisual technologies that add elements like crosshair or FPS counter as well as adjust brightness and contrast settings for particular game genres. Moving on to connectivity, the display is equipped with DisplayPort 1.2, Mini DisplayPort 1.2, and HDMI 2.0 inputs. The monitor also sporots a dual-port USB 3.0 hub and a headphone jack. In addition, the monitor has an adjustable stand that can regulate height, tilt, and swivel. ASUS has not announced pricing of the monitor or its availability timeframe. Considering the fact that a number of companies already offer similar devices, it is highly likely that the ROG Strix XG32VQR will hit the market sooner rather than later. I want to get an AMD card because of nVidia's ridiculous insistence on supporting only the extremely expensive, poorly supported GSYNC refresh sync tech, but I will stick with nVidia until AMD learns to write drivers. You kinda just showed why Gsync is not expensive though. You literally would have to get a new card to use freesync anyways. So its a "tax" just to use freesync if already have a nvidia card. You mean like the LG 34GK950G, where the built in G-SYNC module has crippled the monitor? Compared to the FreeSync supporting LG 34GK950F, the G-SYNC version achieves only 120 Hz rather than 144 Hz, it lacks an sRGB emulation mode and can't support HDR10. Despite lacking all of this, the G-SYNC tax it more expensive. It's simply no longer true that the best monitors support G-SYNC, even if you're paying a higher price for them. The DP1.2 G-SYNC module is simply outdated as it lacks the features mentioned. The newer DP1.4 G-SYNC module doesn't seem ready for widespread adoption and even if it was, it currently seems to be priced out of the market. That's some seriously screwy logic right there. It's still a tax even if you already have an Nvidia card, because you still pay more for exactly the same hardware with a GSYNC module. TLDR: Both nVidia and ATi/AMD have had their share of driver issues. They are generally better now than they were in the past. There is no longer a clearly superior company in regards to driver quality. I can only comment with certainty about cards I have experience with. Ignoring cards from other companies as irrelevant to the discussion of driver nVidia vs ATi / AMD driver quality, I have extensive experience with discrete cards from both manufacturers: Rage Pro, Riva TNT2, Rage 128 Pro, Radeon, GeForce 3, GeForce 4 Ti4200, Radeon 9700 Pro, GeForce 6800 Ultra, Radeon X1900XT, GeForce 8800 GTS 512, Radeon HD 4870, GeForce GTX 260, GeForce GTX 470, Radeon HD 5870, Radeon HD 6870, Radeon HD 6970, Radeon HD 7970GHz, Radeon R9 290, GeForce GTX 780Ti, GeForce GTX 1080, Geforce GTX 1080Ti, Vega64. I have second hand (family/friend/client support) experience with many others besides.